THE AVETT BROTHERS “I and Love and You’’ The best of everything - frenetic bluegrass, stomping punk, earthy roots rock, heartfelt country, giddy pop - crammed into one exuberant, funny, melancholy, and ultimately uplifting package of shiver-inducing harmonies and piercing lyrics. Breathtaking. M. WARD “Hold Time’’ It may be 2009, but indie folk troubadour Ward has perfected the craft of creating music that transcends chronology. His intimate images, from lovers adrift to caged birds singing, find perfect translation in his husky whisper and emotive guitar lines. MASTODON “Crack the Skye’’ Meshing precision and abandon in the way only metal bands can, the Atlanta quartet released a layered masterpiece of delicacy and aggression that listeners can sink into one minute and rock out with the next. There may be a loose story line in there somewhere, but the only concept that truly mattered was the musical release. 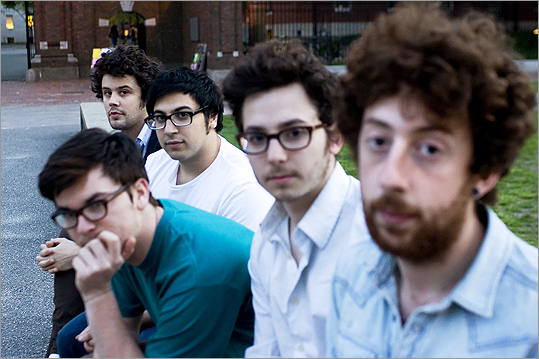 PASSION PIT “Manners’’ Uncontrollable grinning, eruptive hooting, dancing without worrying that people think you look goofy. These were all symptoms of listening to this Hub band’s deservedly hyped debut spilling over with giddy electro-pop. MAXWELL “BLACKsummer’s Night’’ The R&B singer’s eight-year hiatus melts away within the first few seconds on this smooth and sensitive return as the chimes shimmer and that perfectly sculpted falsetto rides a soul-deep groove of horns and bass. Welcome back. GREEN DAY “21st Century Breakdown’’ “American Idiot’’ was no fluke. The spirited Berkeley pop punks continue to age gracefully on this even more expansive follow-up. With a diverse musical palette, the trio recognizes the beauty of contrasts, of asking questions without knowing the answers, and of unabashedly embracing the power of love, eventually touching down at the intersection of rage and melody. 7 WORLDS COLLIDE “The Sun Came Out’’ Under the musically magnanimous eye of Crowded House leader Neil Finn, members of Wilco and Radiohead, Johnny Marr of the Smiths, KT Tunstall, and several other luminaries teamed up to make a benefit album for Oxfam. What could’ve been a disaster produced a colorful variety pack that runs the gamut from stark country noir to burnished pop. JASON ISBELL AND THE 400 UNIT “Jason Isbell and the 400 Unit’’ Isbell is blessed with one of those voices that allows several emotions to mingle at once: regret, optimism, anger. It makes sense since the former Drive-By Trucker approaches his music the same way. Rock, country, soul, and the blues buddy up like barflies exchanging tales tall and true on this polished collection. WILCO “Wilco (the Album)’’ It’s as if the Chicago rockers listened to all of their albums, appraised what was great about them, and offered up a tasting menu. The result is a winning mix of tender lamentations, rip-snorting rockers, adventurous detours, a dash of alt-country flourish and lots of pop pixie dust. NEKO CASE “Middle Cyclone’’ Hauntingly sad and cool as the other side of the pillow, Case sketches out pop and country rock songs of gloriously reverb-soaked contours and leaves the listener to color it in. JOHN MAYER “Battle Studies’’ The pop star moves up a weight class by digging a little deeper. The rewards are quickly evident in songs about love and loss that feel more honest, and therefore more relatable, than ever.